Need a really big reflector or diffuser, or work outside? Or both? The Lastolite Skylite Kit is the right tool for the job. 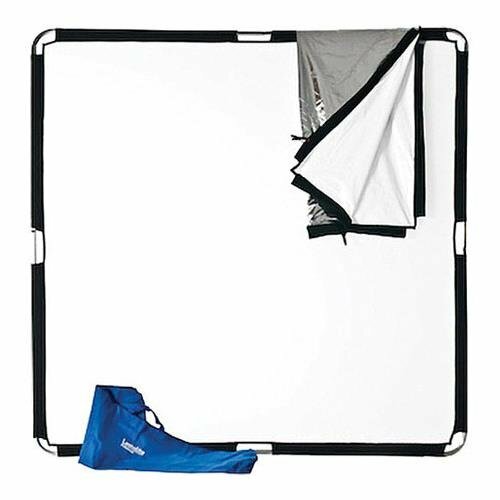 It has a strong and light aluminum frame, an over-sized griphead for quick positioning on a cinestand (sold separately), a Silver/White reversible reflector, a translucent diffuser and a bag to bring it out on location. The Skylite system is lightweight, portable, collapsible, reversible and easy to use. Manipulating light has never been so simple with the Skylite system. Strong, yet incredibly light, Skylite's are the most versatile panel system you'll ever need.Whether outdoors or in, the Skylite is easy to position. The high tensile aluminum frame can be broken down for ease of transport without even removing the fabric. An elastic cord (bungee cord) runs through the center of the tubes so that the tubes are not lost when disassembled. This also makes assembly very easy.